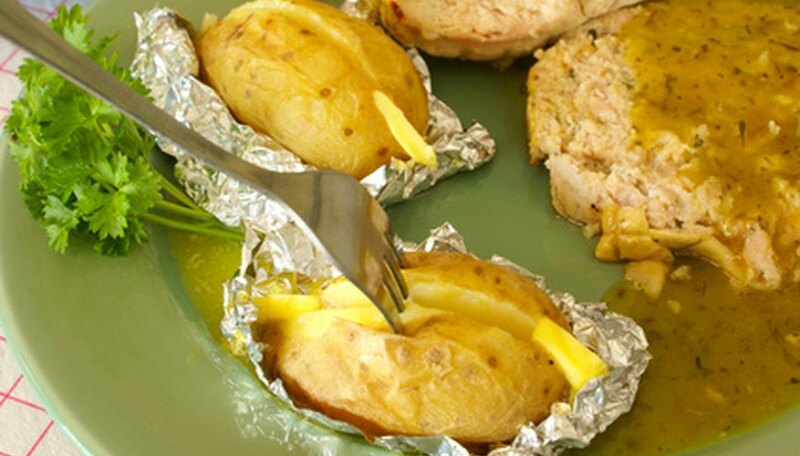 Microwave potato bags can quickly bake up to four fluffy potatoes, giving them crispy skins just as if they had been baked in the oven. They work with both white potato varieties and sweet potatoes. You can create your own quickly and easily using quilted fabric and packaged bias tape. Microwave potato bags are also a thoughtful and easy gift, especially if you choose fabric that matches the recipient's kitchen or reflects his/her interests with its pattern or design. Cut a piece of quilted fabric 10 inches wide by 22 inches long. Cut two pieces of bias tape, each 10 inches long. Unfold the bias tape on one side and pin it along both short edges of the quilted fabric's wrong side. Match the folded-out edge of the bias tape to the edge of the fabric. The bias tape will be used to create a finished edge on the short sides of the fabric. Sew along the fold in the bias tape. Fold the bias tape over the edge of the fabric, enveloping its raw edge. Turn the fabric over and stitch close to the folded edge of the tape. Lay the fabric on a table right side up with the long edges perpendicular to the table's edge. Measure 2 inches down from the top on each side. Mark these points with pins. Fold the top edge toward you, down to the pins. Pin the folded edge you have just created along both sides. Fold the bottom edge up almost to the first fold. Pin along both sides of this fold. The wrong side of the fabric will now be facing up toward you where it is folded over. Stitch with a 5/8 inch seam allowance along both long sides to tack down these folds. Finish and reinforce the seams by zigzag stitching inside the seam allowance. Turn the microwave potato bag right side out. This project is even easier with a serger. Instead of using bias tape you can serge the short edges with a wide stitch. Then you can serge the side seams to sew and finish them in one step. Always use care and follow the manufacturer's instructions when operating a microwave. Make sure you remove all pins before using the bag. Do not use any materials with metallic content in a microwave.